For actor Saif Ali Khan, life definitely seems to have begun at 40, as he puts himself into the league of extraordinary 'Khans' of Bollywood. According to Ganesha, Chhote Nawab who is blowing birthday candles on 16th August is going to have a power-packed year ahead. After tasting the success of 'Love Aaj Kal', as a producer, Saif is coming up with one more film, a home production, 'Agent Vinod', which stars himself and Kareena Kapoor, and is expected to release early next year. Besides professional life, Saif's personal front too seems to be smooth and easy going. Saifeena (Saif+Kareena) may be delaying their wedding, but are very much together. It seems Chhote Nawab has found his lady love in Bebo after a string of affairs and a divorce from Amrita Singh. All's well that ends well! The last year has been quite rewarding for Saif. As he bids adieu to one more glittering year of his life, Ganesha with the help of Vedic Astrology, predicts his coming year. There are three debilitated planets in the Natal chart - Mars, Venus and Saturn. Venus will transit over Natal Jupiter from September 2010 till end of the year. 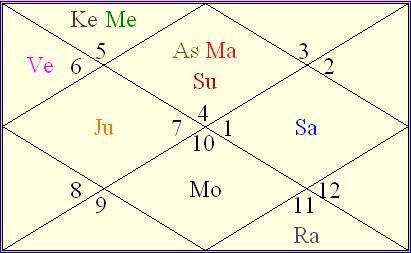 Saturn will continue transiting over Saif's Natal Venus till his next birthday and even for some months after that. Jupiter is currently in Trine with Natal Sun and Mars, plus it aspects Natal Venus. Later - once it enters Aries - it will transit over Natal Saturn and will form Square with Natal Sun and Mars. Ganesha feels that September to December 2010 is the period during which, Saif would be able to initiate some mega project as a producer/director. He even get into a prestigious project as an actor. He will try to hone his skills by paying more attention to his performance. Saif may take a little more time to tie the knot with his lady love. Ganesha strongly feels that Saif's personal life wouldn't be able to affect his career negatively. In fact, Ganesha also feels that within next year's span Saif will come out as a much better performer, as his expectations from himself would be very high. His performances will be appreciated and he will also work for some off-beat kind of a film during the year ahead, as he would be willing to do something different. Financially, the year would be progressive, but as a producer he will have to be very sure of the returns when he plans something till end of 2011, else there are chances of facing financial troubles related to the project that he is handling. Overall picture of next one year seems to be good and we can expect better things from Saif Ali Khan. May Saif have a rocking year ahead, wishes Ganesha.